A residential neighborhood in RW 04, Galur Urban Village, Johar Baru, Central Jakarta looks green and fresh.
" We call it, Kampung Pelangi (rainbow village). It also symbolizes the diversity or plurality of citizens"
Surely it cannot be separated from the role of the local people assisted by Central Jakarta Maritime, Agriculture, and Food Security Sub-agency in a bid to realize the green alley. 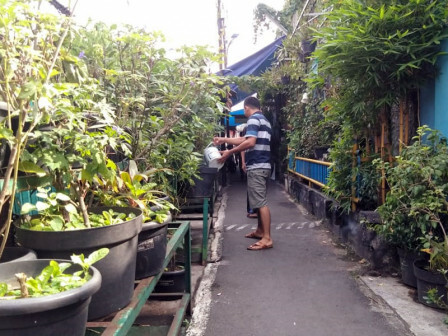 "We received 450 pots of plants and 5 iron racks as part of the planting media," expressed a local person, Asli who received an award from Central Jakarta Administration for his dedication in realizing urban farming, Monday (4/15). To make more beautiful, citizens living in RT 1, 2, and 3 also painted walls, especially on the edge of the alley with various colors. "We call it, Kampung Pelangi (rainbow village). It also symbolizes the diversity or plurality of citizens," he explained. Johar Baru Sub-district City Plant Working Group Chairperson, Rudy Suherman, very appreciated it. "They are very compact, including in maintaining the plants," he stated.